Medical Conferences are one of the most promising platforms to discover the right experts and identify the right KOLs for your business objectives. In order to successfully manage and streamline complex key relationships with their KOLs, Life Science companies require a comprehensive business approach that identifies, maps and profiles each Thought Leader. These companies need to develop a structured and holistic framework to identify, profile, update, track and measure impact of KOLs - to engage them better, on a continuous basis. It is important for Life Science companies to understand how they can identify Top KOLs by leveraging the sessions and networking opportunities at professional medical conferences. These companies constantly try to cut through the layers of information at medical conference in their quest to identify the right KOLs - whether local, regional, national or international - who could significantly benefit and boost their business. Medical conferences act as a global marketplace for healthcare Innovation, where invited speakers include top Life Science professionals, along with representatives from the Pharmaceutical, Biotechnology, and Medical Devices & Equipment Industry as attendees. These conferences have a long and impressive list of representatives from Academic Institutions, Advocacy Groups, Clinicians, Health IT, Imaging, Diagnostics and Publications and Continuing Medical Education. For many Life Science companies, this Thought Leaders’ pool is nothing but an ‘overlooked’ or ‘unimagined’ opportunity, for which they need to find a way to ‘make it happen’. Life Science companies are aware of the importance of identifying the right Thought Leaders and invest their time and resource to achieve their KOL Management goals. They need the most effective and efficient ways to collaborate with the Healthcare Professionals (HCPs), who conduct research, publish articles, or attend a top-level medical conferences. So, these medical conferences act as a platform for Life Science companies to spot an opportunity and having the means to convert that opportunity into a viable business. These companies have understood that every Thought Leader possess different interests and prefers to be engaged differently. Some of these KOLs are very clinical-based in their interest and others are engrossed on research. Such diversity in interest areas makes it important for companies to assess and re-evaluate the needs of Thought Leaders on a regular basis. This also helps the Life Science companies to ensure an ethical, long-term partnership with their Thought Leaders. In fact, when it comes to managing and nurturing thought leader relationships and specifically the process of identifying KOLs, Life Science companies have several options. Having the mind-set, skill-set and toolset to implement a comprehensive KOL identification venture within an organization is the very essence of the whole process of KOL Management. MSLs and clinical development teams in particular are often valuable resources for identifying potential KOLs. Many Life Science companies’ KOL management depends on these networks. Others may choose to outsource the identification process and contact KOLs once they’ve been identified by the third-party vendor. In a nut shell, KOL Management takes various factors into account including the Professional analysis, Sociometric analysis, Bibiliometric analysis and Social Network of the KOLs, which help in effective and efficient collaboration with the KOLs. Studying the convergences of these analysis and application of the precepts provides insight into current Thought Leaders, and also leads to accurate predictions of upcoming and rising KOLs. In this framework, KOL ranking is constantly varying and is created through changing professional engagements. Mapping and identifying the right experts is crucial for categorizing the most talented collaborators for clinical trials, advisory boards and peer-to-peer programs. Life Science companies implement the combination of positional analysis, bibliometric analysis and sociometric analysis to identify leading experts for a given therapeutic area. The process involves ranking methodology, combination of traditional and social footprints of influencers across therapeutic areas, regions and languages. However, mapping process helps segment KOLs on the basis of factors such as geography, relevant research interests and peer influence etc. Life Science companies can conduct this mapping exercise very early in the product lifecycle, with contributions from various sources, such as CRM, affiliates and existing KOLs. In fact, knowing your Thought Leaders is only the first step to KOL engagement. Once the experts are identified and aggregated, their medical profiles are to be created with the objective of providing a complete and all-inclusive view on the KOL, for both individuals as well as organizations. 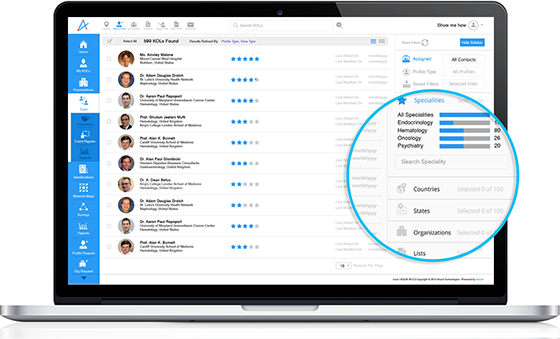 Comprehensive medical profiles of these KOLs capture details such as, Biographical information, Activity participation history, Publications activity, Clinical trials activity, Educational details, Network maps along with Personal and Contact information. Profiling these HCPs helps Life Science companies understand their professional interests, scientific research, networks and connections. The analysis not just helps in identifying experts at professional medical conferences, but more importantly, offers an enhanced understanding of these conferences, which makes the whole process of KOL identification a successful one. From learning rapid advances in science and technology, to the challenges of medical care delivery, growing demand for medical care around the globe and opportunities for medicine; conferences deliver a vast array of useful information in a short space of time. For larger and mid-sized companies that are looking for identifying new market opportunities, and to learn how other businesses operate and tackle industry-specific challenges; such conferences act as an extremely valuable and effective option. In fact, for smaller companies or new thought leader development groups also, these conferences are of great value.